Author(s): George R. Heaton, Benjamin M. Davis, Lisa A. Turner, Maria F. Cordeiro. Glaucoma & Retinal Degeneration Research Group, UCL Institute of Ophthalmology, Bath Street, London, EC1V 9EL, UK. Alzheimer’s disease (AD) is a devastating neurodegenerative disease characterised clinically by a progressive decline in executive functions, memory and cognition. Classic neuropathological hallmarks of AD include intracellular hyper-phosphorylated tau protein which forms neurofibrillary tangles (NFT), and extracellular deposits of amyloid β (Aβ) protein, the primary constituent of senile plaques (SP). The gradual process of pathogenic amyloid accumulation is thought to occur 10-20 years prior to symptomatic manifestation. Advance detection of these deposits therefore offers a highly promising avenue for prodromal AD diagnosis. Currently, the most sophisticated method of ‘probable AD’ diagnosis is via neuroimaging or cerebral spinal fluid (CSF) biomarker analysis. Whilst these methods have reported a high degree of diagnostic specificity and accuracy, they fall significantly short in terms of practicality; they are often highly invasive, expensive or unsuitable for large-scale population screening. In recent years, ocular screening has received substantial attention from the scientific community due to its potential for non-invasive and inexpensive central nervous system (CNS) imaging. In this appraisal we build upon our previous reviews detailing ocular structural and functional changes in AD (Retinal manifestations of Alzheimer’s disease, Alzheimer’s disease and Retinal Neurodegeneration) and consider their use as biomarkers. In addition, we present an overview of current advances in the use of fluorescent reporters to detect AD pathology through non-invasive retinal imaging. Keywords: Alzheimer’s, biomarker, diagnosis, ocular, pathology, retina. Affiliation:Glaucoma & Retinal Degeneration Research Group, UCL Institute of Ophthalmology, Bath Street, London, EC1V 9EL, UK. 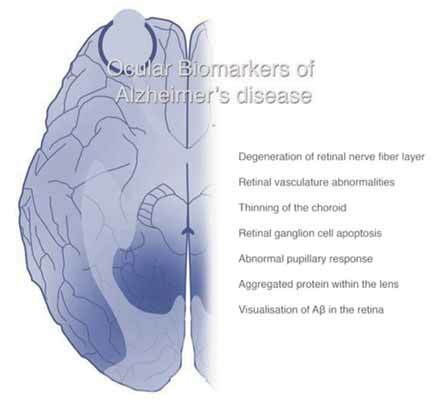 Keywords:Alzheimer’s, biomarker, diagnosis, ocular, pathology, retina. Abstract:Alzheimer’s disease (AD) is a devastating neurodegenerative disease characterised clinically by a progressive decline in executive functions, memory and cognition. Classic neuropathological hallmarks of AD include intracellular hyper-phosphorylated tau protein which forms neurofibrillary tangles (NFT), and extracellular deposits of amyloid β (Aβ) protein, the primary constituent of senile plaques (SP). The gradual process of pathogenic amyloid accumulation is thought to occur 10-20 years prior to symptomatic manifestation. Advance detection of these deposits therefore offers a highly promising avenue for prodromal AD diagnosis. Currently, the most sophisticated method of ‘probable AD’ diagnosis is via neuroimaging or cerebral spinal fluid (CSF) biomarker analysis. Whilst these methods have reported a high degree of diagnostic specificity and accuracy, they fall significantly short in terms of practicality; they are often highly invasive, expensive or unsuitable for large-scale population screening. In recent years, ocular screening has received substantial attention from the scientific community due to its potential for non-invasive and inexpensive central nervous system (CNS) imaging. In this appraisal we build upon our previous reviews detailing ocular structural and functional changes in AD (Retinal manifestations of Alzheimer’s disease, Alzheimer’s disease and Retinal Neurodegeneration) and consider their use as biomarkers. In addition, we present an overview of current advances in the use of fluorescent reporters to detect AD pathology through non-invasive retinal imaging.